We get asked many questions about soundproofing, and a lot of them we’ve been asked before. So, we decided to answer some of our most asked soundproofing questions in a blog post to help save you all some time. However, if this doesn’t help with your enquiry, you’re more than welcome to contact us if you want a quote or just help with any soundproofing question you have. How effective is using egg cartons to soundproof a room? One of the main qualities of a good soundproofing material is that they absorb noise, which egg cartons do not do effectively. They help diffuse mid-range frequencies which can be good for a recording environment, but in a strictly soundproofing sense, there are many other superior options. What kinds of glass are soundproof? The act of putting any object between you and a source of sound can be considered “soundproofing”. Their actual effectiveness as soundproofing however will differ between materials, and for glass this is often decided by its thickness. Something like annealed glass is generally thin, so for the best soundproofing effect we would recommend using layers of these together if possible. A pane measuring at 1/8” thick can be considered “double strength”, but for ideal sound stoppage a thickness of 1/4″ would be perfect. 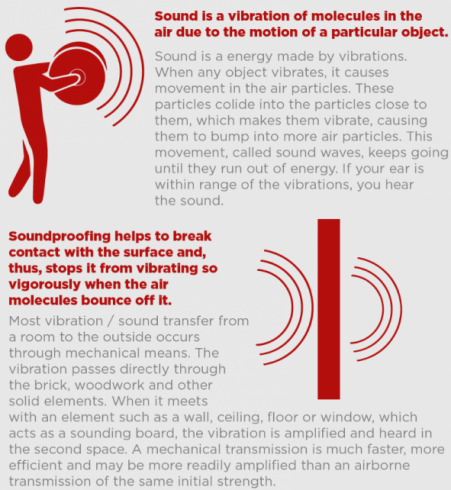 A snippet from our soundproofing infographic. What is the most effective method of soundproofing walls? The most effective method will always be to get a professional in to do the job. We have seen a lot of people try to use egg cartons in the past (which is why we featured the question in this piece) or some other cost-cutting method and, while it might be cheap, they are generally incredibly ineffective. Cutting corners can be a waste of time, resources and also even a health hazard if handled unprofessionally. Soundproof curtains are great for small scale soundproofing, like stopping traffic from outside bleeding in. They won’t help much with higher decibel levels however, as noise will always find a way in/out through cracks or gaps in materials and in the case of soundproof curtains, can just move below or around them. This is why tailor-made, soundproof installations are always recommended, but curtains are easy to install and should be effective enough to help with minor noise pollution. How much would it cost to soundproof a room “this” size? So many factors can contribute to how well a room can hold sound or protect itself from it, and these all need to be taken into consideration when budgeting for a room. Using London Sound Proofing as an example however, our prices start from £60 per square meter for labour and material. However, we are happy to provide advice and a quote – for free! Visit our Contact Us page for more information. This entry was posted on Monday, September 11th, 2017 at 8:38 am	and is filed under FAQ. You can follow any responses to this entry through the RSS 2.0 feed. Responses are currently closed, but you can trackback from your own site.